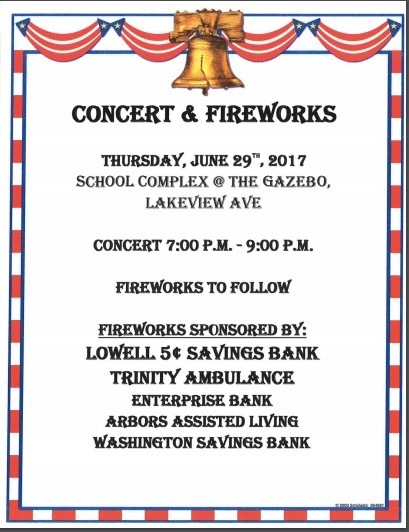 The Town on Dracut's Independence day celebration will be held on Thursday June 29 starting with a concert at 7:00 pm. This event is located at 1570 Lakeview Av, in front of the Englesby Elementary school at the Gazebo. The fireworks display will follow the concert at approximately 9:00 pm. Expect traffic delays during this time on Lakeview Ave, and use other routes if possible.